Today, we’re wrapping up our 2015 Summer Grilling Series, but grilling season is far from over. There’s still plenty of time to take advantage of using the grill, and all the topics we covered this month can propel you into delicious, grilled summer meals. We teach you the basics and techniques of grilling to help you improve your grill skills, whether you are new to grilling or have grilled many times before. With this foundation, your cooking knowledge doesn’t stop when summer comes to an end. Includes all the basics you need to get started, including our top 5 essential grilling tools. Shows you the various cooking temperatures of meat, so that you can cook meat to perfection every time. A visual aid on how to use a gas grill and how to cook meat and veggies, so that you have a firm foundation to continue building your grill skills. This week, we have saved the best for last. 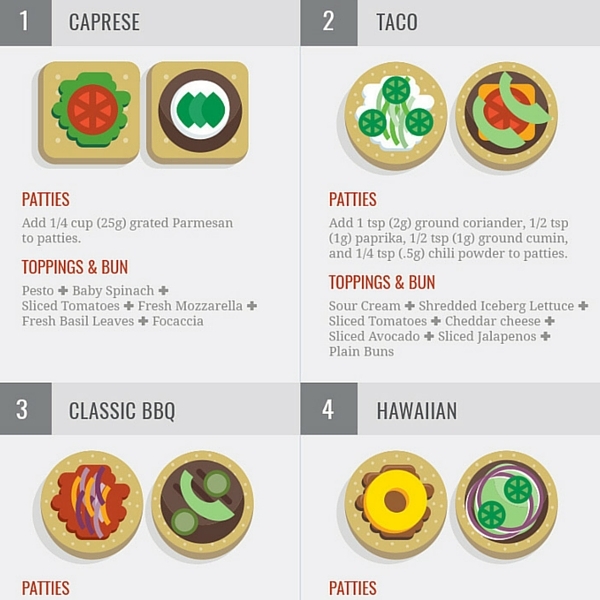 Everyone always gets so excited whenever we have a new infographic, so we’ll be ending this series with an awesome new infographic guide that features a summer favorite – burgers! Not only does this Ultimate Burger Guide provide recipes, it also teaches you how to cook burger patties on the grill or on the stove top, and it includes 20 delicious, lip-smacking burger combos that you can refer to whenever you need a change of taste from the typical bun + patty + lettuce + tomato combo. Our Burger Guide has a patty for every taste, sauce recipes to jazz up your burger, and lots of ideas for flavorful toppings to mix and match all summer long. . .or whenever you feel like firing up the grill. This video shows you how to get the most perfect, juiciest burger. Lastly, our burger combos are not meant to be followed rigidly, but rather, to inspire. Feel free to switch up the ingredients or mix and match ideas as you please, so that you can enjoy a variety of burgers tailor-made to your tastebuds. 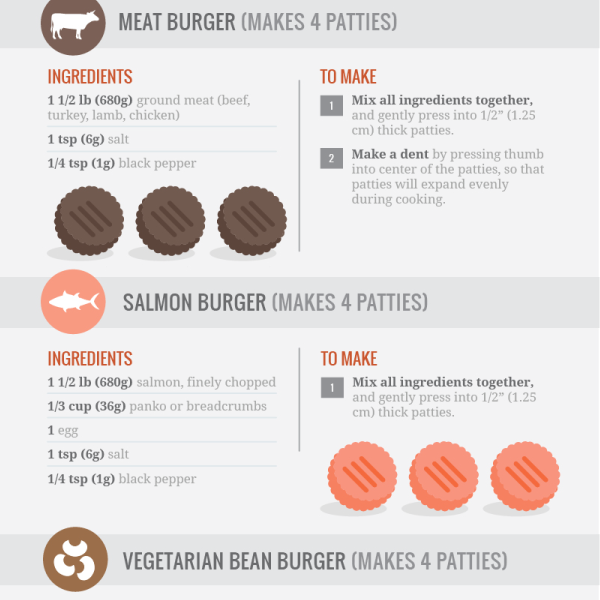 We hope our Ultimate Burger Guide inspires you to get grilling and to create many different, tasty burgers for the summer. As always, we work incredibly hard to create this cooking info, so please do help us spread the smarts! Can’t get enough of grilling or need some ideas for what to grill? For more grilling recipes, click here. As always, we work hard to create these resources to make life in the kitchen simpler and smarter, and we’re always creating more helpful info to raise your kitchen IQ! To get our cooking tips, join our cooking community by signing up for our newsletter, and together, we will make cooking simple, fun, and delicious.